Big Caboose is a character who appeared in "Forty Percent Leadbelly". He was created after Bender started to peruse his dream of being a folk singer. 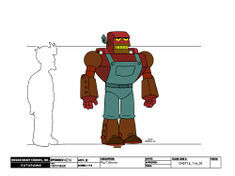 Big Caboose was a character in the story Bender unwittingly created by using a digital printer linked to his wireless connection. In that story, Big Caboose was a worker on the railroad where Bender went to get inspiration for his folk song. Bender sleeps with Big Caboose's girlfriend, Jezebel, and causes Big Caboose to seek revenge. Big Caboose attempts to kill Bender with a train but instead kills Duplicate Bender.